In early May, when it looked like it might rain for ever, we decided it was time for some sun. We really like the Eastern Mediterranean. As we had spent 2 weeks in our favourite country Greece last year it was Turkey’s turn this time. The Holiday Property Bond have a relatively new site Physkos in Turunç which is a village not far from Marmaris in the south-west. We booked a studio for a week starting on 20 June. Turunç is 2 hours drive from Dalaman airport and not much further from Bodrum. The flights from Leeds were all arriving late at night. We didn’t fancy driving too far in the dark especially as we had read that the last 20 minutes to Turunç was over a twisty mountain road. As we’d been to Dalaman before, we decided to give ourselves 3 extra days and booked a flight to Bodrum on 17 June. We had booked 2 nights at the Manastir hotel which is on a hill with a spectacular view overlooking the bay. We managed to find it at 11.30pm with the aid of a Google map and Martin’s Turkish. Next day it was very hot, approaching 40C, but, after a wonderful breakfast, we ventured out on foot down the hill and walked along the sea front. After a tea stop we tackled the castle which is on a promontory by the sea. It’s really a collection of different buildings with a long history beginning in 1404. Some murals caught my eye in the first courtyard, but I didn’t manage to find out who painted them. There’s a chapel which became a mosque, and various towers but the main feature is that it now houses an excellent museum of underwater archaeology with large displays of amphorae in the hulls of ships. I took a picture of a huge photo showing the archaeologists at work. Fortunately the interior rooms were well air-conditioned. 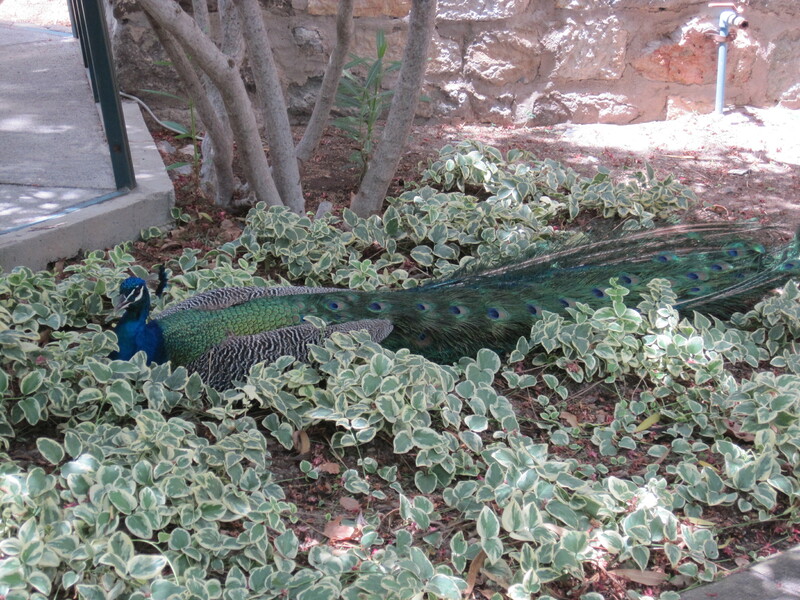 The castle’s only inhabitants now appeared to be some peacocks one of whom was having a snooze among the plants. After a cheap and cheerful Turkish lunch we took at taxi back to the hotel. In the evening (still very hot) we walked back down to the waterfront and, forgetting that restaurant fish is priced by weight, had an expensive fish dinner accompanied by a very elegant salad. 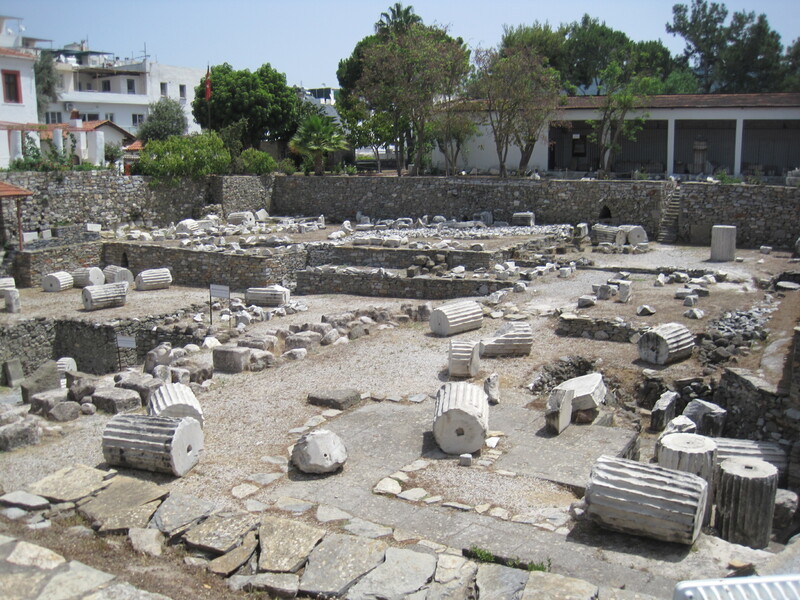 Bodrum is the site of ancient Halicarnassus where Herodotus the “Father of History” was born. It’s also the location of the original mausoleum, the tomb of Mausolus of Caria built around 350BC and one of the Seven Wonders of the Ancient World. 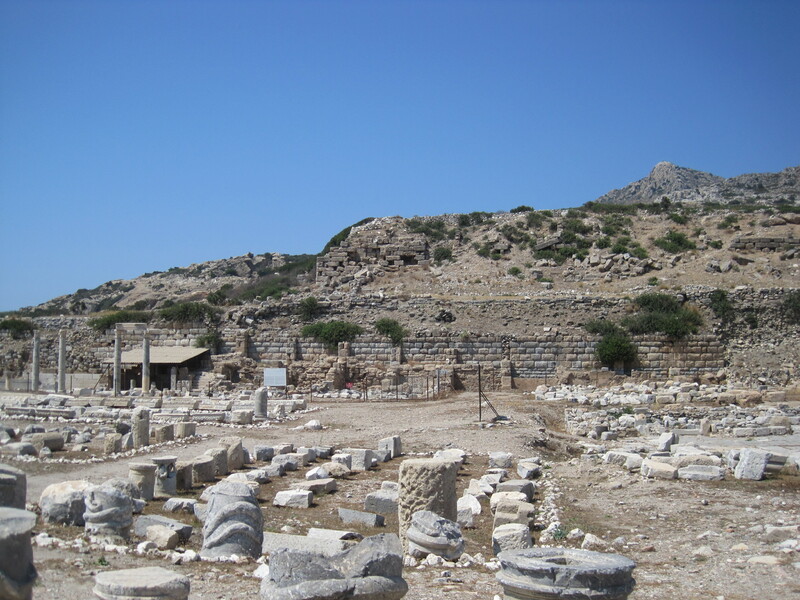 We stopped by there on our way out of Bodrum, but there’s very little of it left now – just piles of stones and a few columns in the middle of some suburban streets. The museum there has a model, based on descriptions by some ancient writers, which shows how big it was. 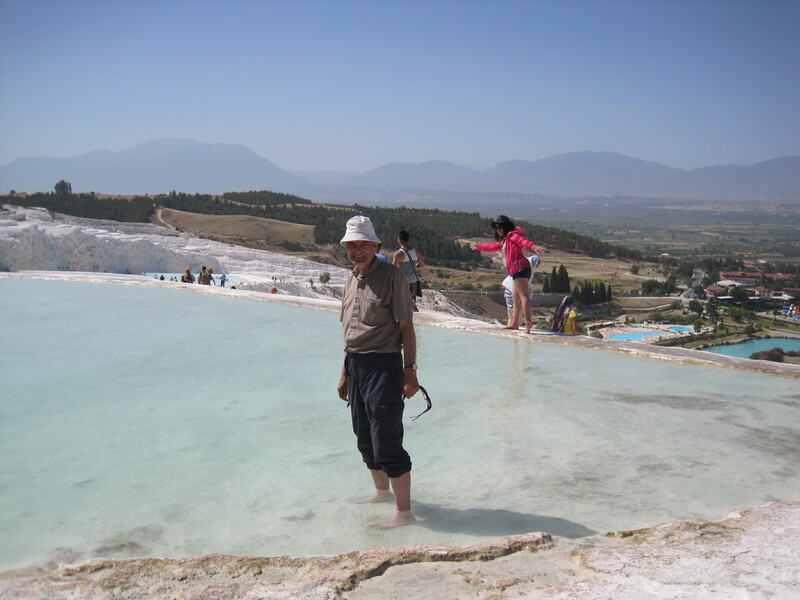 It’s about 250km from Bodrum north-east to Pamukkale (“cotton castle”) where there is a huge area of white terraces and pools. We took a cross-country route and passed through one village with a lot of storks’ nests with young ones. Rather foolishly we had set off without any food. Getting more and more hungry we came to an area with a lot of marble quarries and just one restaurant where, fortunately, the owner spoke very good English. We had a good lunch there. He told us that he used to work in Turunç and gave us some restaurant recommendations. Finding our hotel in Pamukkale was a little interesting but we got there in the end. 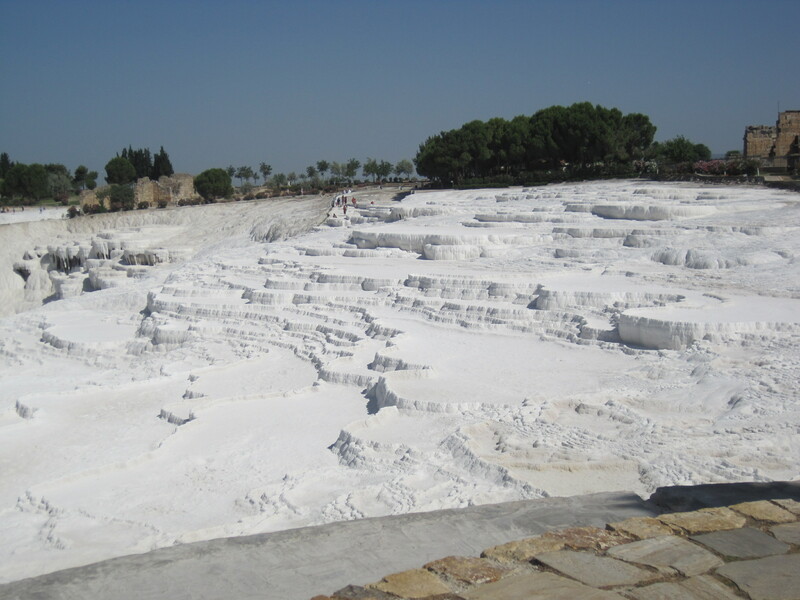 It’s well worth the trip to see the white travertine terraces and warm pools. We were last there almost 40 years ago when we stayed in a small hotel overlooking the terraces with our own private mineral water pool where we could bathe. All that is no more. It’s now a UNESCO World Heritage Centre. The town at the top has been replaced by nice landscaping and a new town has been built at the bottom of the hill. Very many Japanese tourists were trudging up the hill in 40+C and bright sunlight. At least we only had to walk about 500m from the car park. The travertines are a big area and you can walk on some of it, only in bare feet to prevent any more damage to terraces. Tourist officials were very vigilant with a whistle if they saw a transgressor. We both paddled a little – it was quite slippery. There are also plenty of remains of ancient Hierapolis nearby, but it was a bit too hot to explore far – thank goodness for my umbrella in the bright sun. 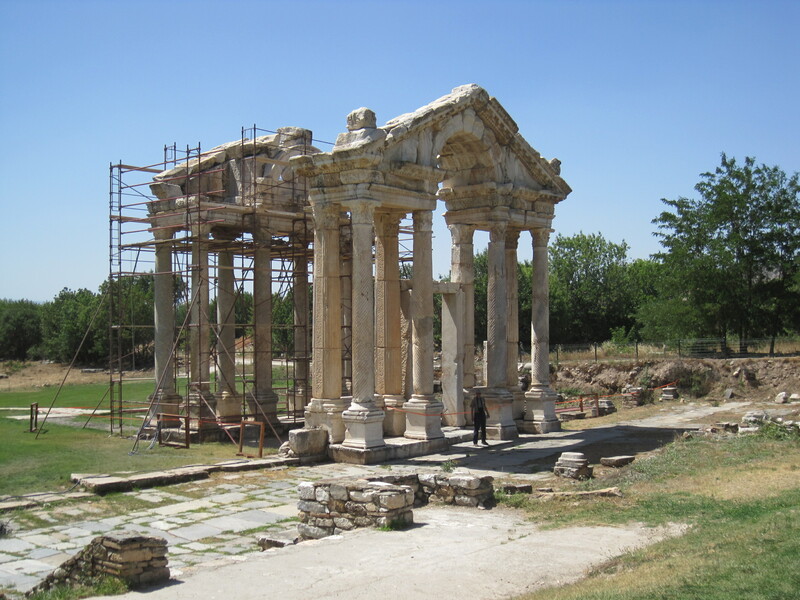 It’s another 200km to Turunç from Pamukkale but we took a 35km detour across relatively flat land to the site of Aphrodisias which is named after Aphrodite the Greek goddess of love. This is a huge site a long way from any sizeable town. When we got to the turnoff close by the site there was one small tourist shop and a rather grotty looking hotel. Hungry again – why hadn’t we taken food? The hotel owner produced a couple of pides (a kind of pizza) which we ate outside, declining to look at the dusty interior. We had to leave the car there and were taken to the site in a trolley attached to an ancient tractor. There did not appear to be anybody else there. The new museum was a welcome relief not only for the air-conditioning but also for the many excellent statues and other carvings. We took a walk round some of the site (map wrong again) and got a sense of the huge size. If you are into Ancient Greek remains, this site is well worth a visit, but preferably when it’s not so hot. The tea shop was open and the dodgy tractor was waiting for us by the gate. We saw three other young tourists there and far more staff in the museum. The temperature reached 43C that day. We got to Turunç about 7.30pm to find one of the HPB hosts waiting for us. The route took us through Marmaris (endless bars and tourist shops) and Içmeler (better looking hotels) and then the mountain road (48 bends) which was fine. We had a top-floor studio with a small kitchen kitted out with IKEA pots and pans and (thank goodness) BBC World on the TV. 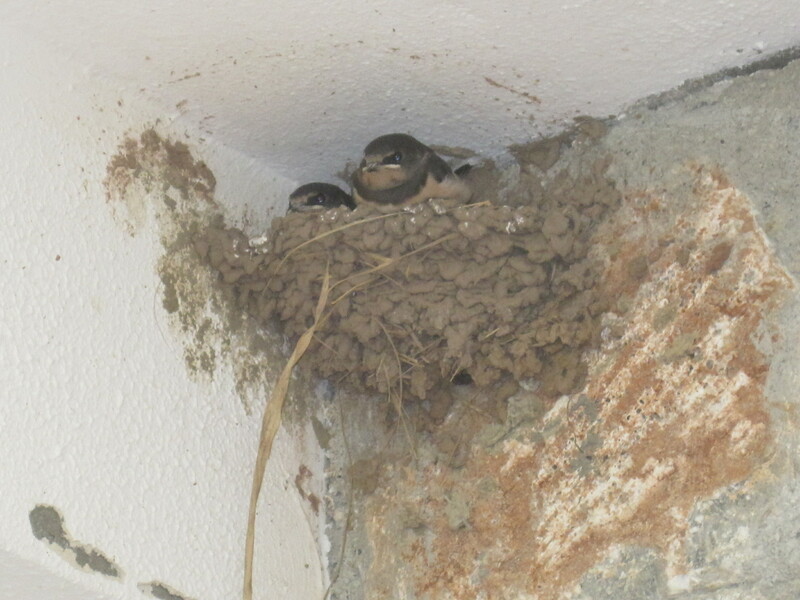 Our staircase had some more inhabitants – house martins with two nests with little ones. It’s a good 10 minute walk to the main street and sea where most of the restaurants are. We had an excellent meal at Yakamoz, one of the recommendations from our new friend from yesterday. It was very quiet. We only did the HPB welcome meeting and the supermarket on the first day. Walking about in 42C is not really a very good idea. On the second day we ventured out in the car only as far as the next two bays. Martin walked around the ancient site at Amos for about 30 minutes but I decided against the heat. 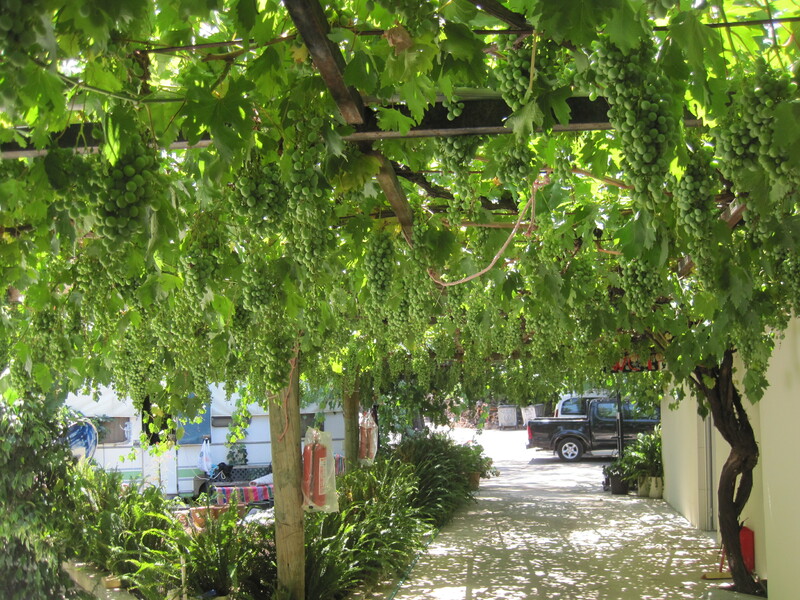 We had some tea at the furthest bay Kumlubuk, then an excellent lunch by the sea at Amos in a restaurant with a grape vine which had more bunches of grapes than I had ever seen before. A large pseudo-pirate ship was moored there obviously on a day trip from Marmaris. This part of the Turkish coast is riddled with inlets and bays and is much favoured by yachties who are the only people who can get to some of the beaches. The real pirates are long gone, I think. Our third day at Turunç was referendum day but we had already voted by post. We did a longer day trip around the Bozburun peninsula. The further we got along the peninsula the more rural it became. We had lunch at a very quiet village and then were definitely in the old Turkey. Near the end of the road we saw goats and donkeys and several fishermen were taking a siesta in their boats. 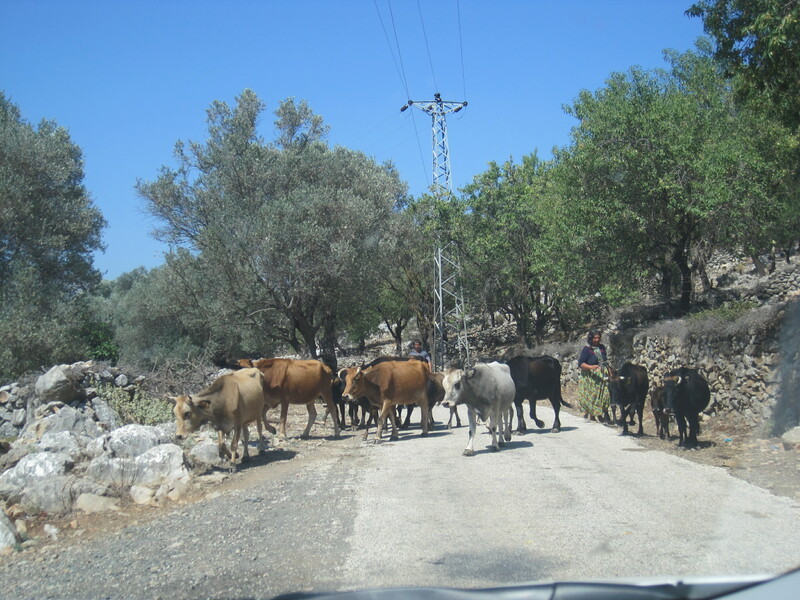 On the way back we came face to face with some cows on the move just like in Nidderdale except that the lady with them was in Turkish dress. We took a different route for some of the way back – more of somebody’s favourite roads – and were last arriving for the HPB barbecue. On the Friday we woke up to the referendum result. Turkey is 2 hours ahead of the UK and David Dimbleby was just announcing the result as I switched the TV on. We could barely believe this and spent most of the morning watching the news unfold. Eventually we decided cheer ourselves up with another trip out, this time to the Datça peninsula. Part of the route was on a very good road then it became very twisty and there was plenty of wet tar because of the heat. We ate lunch in a Turkish tourist village called Palamut which is one of the few Turkish words I remembered from my previous visits as it’s the name of a fish. Our main objective today was to visit the ancient site of Cnidos which is on the sea almost at the end of the peninsula and close to Kos in Greece. This is another fairly large site, with a well-preserved theatre, fortunately only a short walk from the gate. There’s no clear path round this site, not ideal for those visitors who were wearing heeled sandals or flipflops. It was still very hot and I sat under a stone while Martin walked round more of it. We were rather late back and even later going to dinner as Martin attempted not very successfully to clean some of the tar which had stuck to the car. By Saturday the temperature had returned to the mid 30s. We had a quieter day watching the fallout from the referendum. How can all these politicians just vanish when there’s news they don’t like? On our last day in Turunç we took the water taxi to Marmaris, a trip of about 45 minutes. On the boat we got talking to somebody who was obviously a leave voter. He said something about European passports and then his face just fell when I said that we could now end up in the “anyone else line” at passport control. It had obviously not occurred to him. The HPB host had suggested turning right when we got off the boat to go into the old town, thus avoiding most of the noisy tourist bars and shops. We found ourselves in the bazaar and had lunch sitting out at a local place in an alleyway. 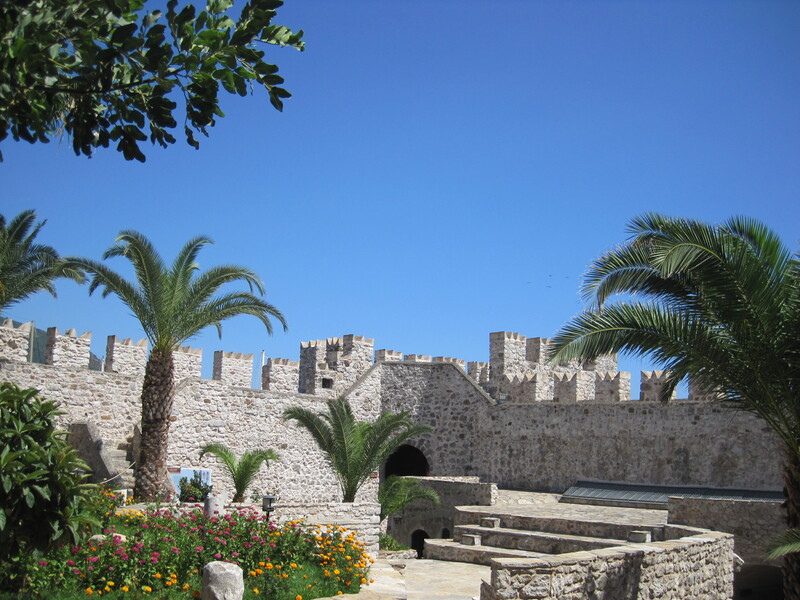 The castle at Marmaris is much smaller than the one at Bodrum, but well worth a visit. 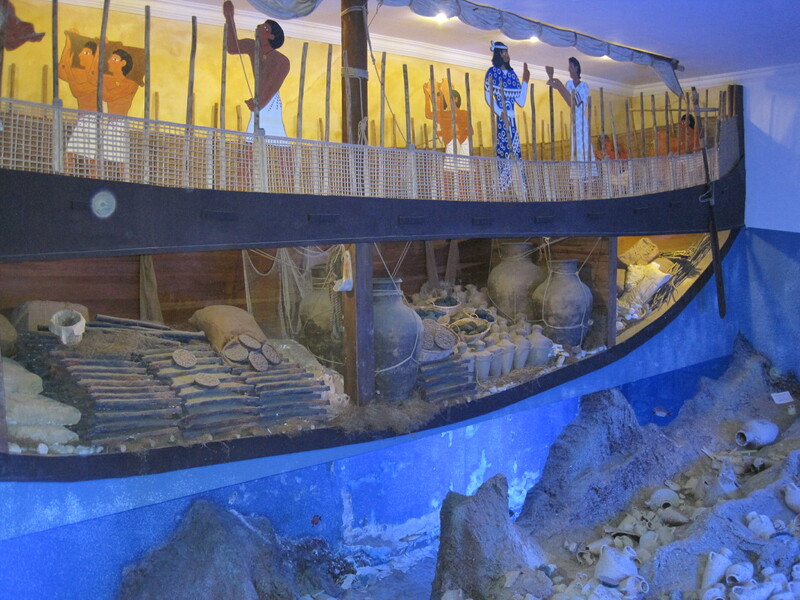 It’s well kept and has a pretty courtyard and a small museum with more underwater archaeology exhibits. Walking back along the sea front we saw the “pirate” ship which we had seen at Amos. It really looked like a bit of Disney in Turkey. 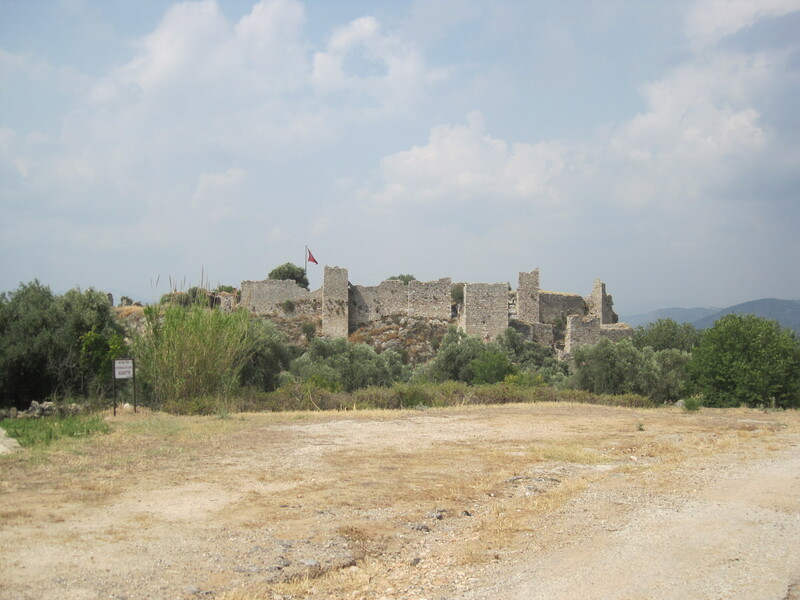 With time to spare we took a brief detour near Milas to visit the castle at Beçin. We drove up the road to it and found a barrier across the road and what appeared to be a brand new car park and new building. All looked deserted but eventually somebody came out of the building, moved the barrier and said we could drive right inside the site. This saved us a walk uphill. The castle was originally Byzantine and later became Ottoman. There are ruins of several other buildings there – and the map was accurate. There were no other visitors there, only some locals driving through fast in a pickup truck, but it’s worth a detour. We had our last tea in Iasos, a real local village with a few fishing boats, before heading back to the airport. Since we moved to Nidderdale we have had less choice for flights. The nearest airport Leeds/Bradford (LBA) is just over an hour away and has cheap long-term parking only 5 minutes from the terminal. Jet2 was the obvious choice to Turkey from LBA. They are one of the better cheap airlines. Of course you have to pay for baggage but you get 22kg per bag and we find that one bag is enough for 2 people for a week. We ordered a hot meal which, curiously, was provided in a box, not on a tray. Some downsides. Their seats don’t recline and there’s no room in the seat back pocket even for a small book. LBA seems to have only 1 real jetway which, as far as I can tell, is only used by British Airways and so you have to walk out to the plane and climb the steps which can’t be great in the middle of a Yorkshire winter. Our flight was on time but another one had been delayed and the lounge, if you can call it that, was jam-packed with nowhere to sit down and a lot of noisy people drinking. 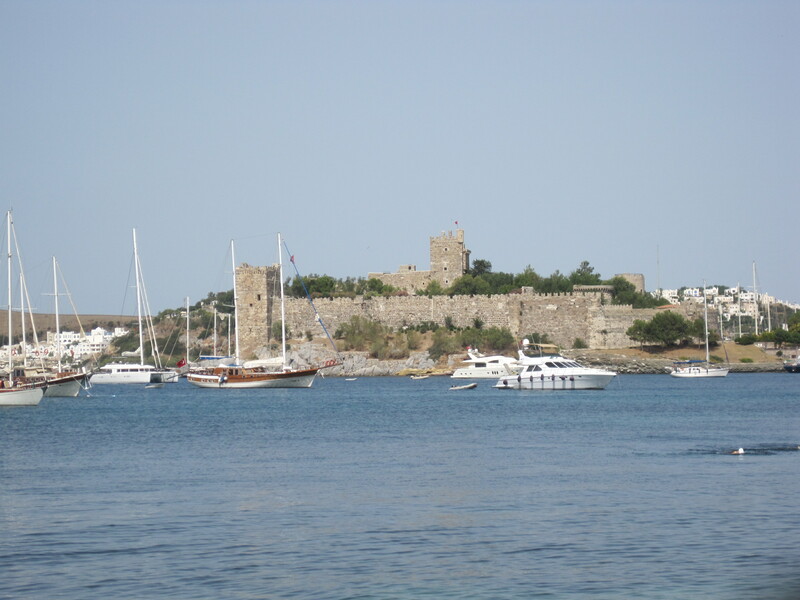 Bodrum airport is about 35 km from Bodrum and much nearer Milas. Finding the car at the airport was interesting as they’d only just opened a new terminal for international flights and there were no car rental desks there. Neither was there any sign of an agent from the car rental company we had booked. We walked the short distance to the domestic terminal, found the desk there and then had to wait for the agent to come with the car. All was fine after that except that we really wanted a small car with manual transmission – much better for twisty mountain roads – but we got a larger automatic. I liked that fact that there was additional security going into the terminal building where all persons and all baggage were screened. Driving in Turkey was no problem except for melting tar on some roads. The main roads have been improved a lot since we were last there. The road signs are excellent on the main road and not bad on minor roads. We had a road map from our last visit a few years ago and we looked at some other maps. None of them were entirely truthful, but were enough to get around. We had the latest version of the Rough Guide which was very useful, also the Sunflower Turkish Coast Bodrum to Marmaris. We have several of the Sunflower books and have used them for walking. It was too hot to walk far on this trip but the walks in this volume looked more ambitious than those in the some of the others. The food was wonderful. Breakfast was huge in the two hotels we stayed at with cheese, yoghurt, eggs, salads and fruit as well as all kinds of cereal and bread. We ate very well in a lot of restaurants. One night I had a whole seabass grilled with herbs and rice and chips for about 5 pounds. 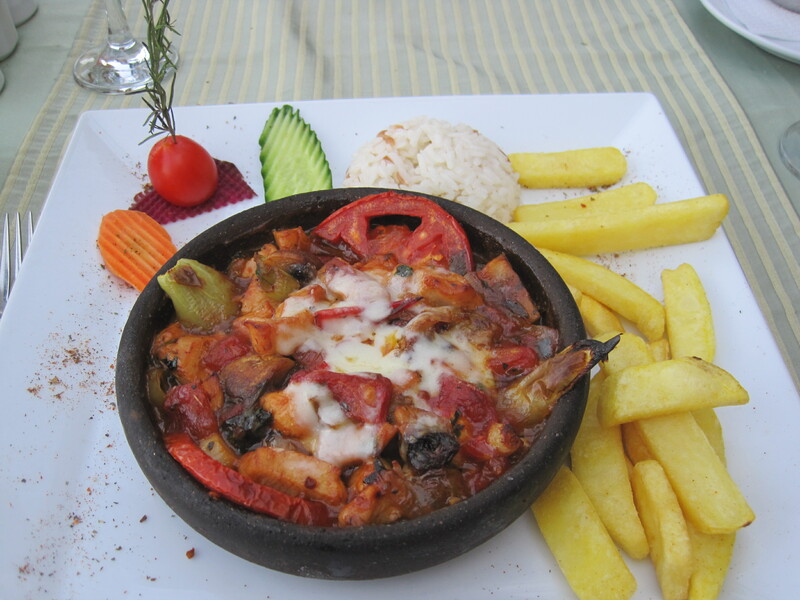 We had some excellent guveç which is an oven-based stew with mediterranean vegetables cooked in a clay pot, and a variety of meze of which my favourite is patlıcan (aubergine salad). A Turkish cookery book has arrived from Amazon since we got home. We also really like Turkish tea which they serve in little curved glasses, although some of the glasses had grown since our previous visit. Turkish is one of those languages where you don’t recognise a single word. Everybody we met spoke English, but they were very pleased to find that Martin could speak a little Turkish and even I recognised some of the food vocabulary. Turkey is one of our very favourite countries. The failed coup happened not long after we got back. We would have been safe at Physkos, but something like this can be unnerving. I felt most sorry for all the people who make a living out of tourism. Business was slack in the restaurants when we were there and I can’t see it getting better any time soon. Let’s hope they sort themselves out quickly. Is this Disney at Marmaris?? This entry was posted in Uncategorized and tagged Bodrum, Bozburun, Cnidos, HPB, Marmaris, Pamukkale, Physkos, Turkey, Turunc. Bookmark the permalink.